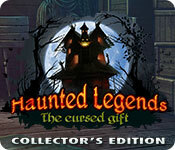 Haunted Legends: The Cursed Gift Collector's Edition is rated 3.9 out of 5 by 24. Rated 5 out of 5 by Pandora1000000 from I didn't want this to end ! Genuinely creepy and jumpy in parts. Gorgeous graphics, St Germain as evil as ever, great storyline. Recommmended ! Rated 5 out of 5 by 2020moonlanding from The Cursed Gift I have enjoyed this game immensely. It has an old school charm to it with graphics and storyline that remind me of my favorite games from a few years ago. But also has all the bells and whistles of today's games. For me, it's the best of both worlds. I'm planning on checking out some of the earlier Haunted Legends that I have missed. This is a series you don't want to pass on. Rated 5 out of 5 by gyanda from Excellent game! This is a great game, i love the fact that the dwarf is finally again really playing an active part in the game - in the former games you often only saw him getting away and laughing - but this is so much better. His voice suits so well his character and it is such a refreshing energy - i always feel this with this dwarf, although he is the bad guy, he has something to it that i really love. With the last games of the series i was afraid, the series would end. Who would have thought that he has this great great revival now! I just love this dwarf, can't help. And please, keep up the excellent work, dear developers!!! This dwarf is a great figure!!! Rated 5 out of 5 by Marja67 from He's baaacccckkk! Love these games. Own them all. Pretty graphics. Easy navigation. 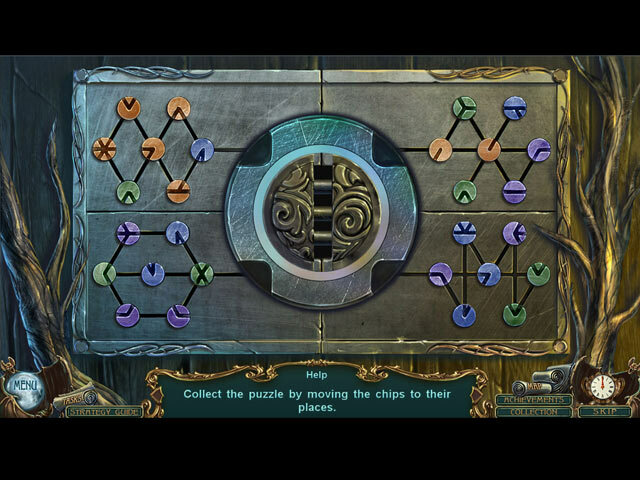 Great puzzles and look for collectibles. Rated 5 out of 5 by fiewi1 from The dward gets what he deserves Well, this devious dwarf got in your way long enough. And justice is served at last. A beautiful game with unique features and strong game play. You collect decorative flames that equal money with which you restore your house in the woods. I only found a bit awkward the back-forth setting of the narration. Rated 5 out of 5 by r1tutu from Excellent, fun, game! This was a game once I started it was hard to stop. It was fun, somewhat challenging, great graphics. I could go on but I suggest you try this game without hesitation and enjoy the fun! I only wish the Bonus Chapter allowed some more time to continue playing. I can honestly say there wasn't anything I didn't like about this game. Rated 5 out of 5 by pennmom36 from HOW DO WE THWART THE DWARF That evil dwarf, Saint Germain, is at it again, and he's anything but a saint! SG has his sights set on Sebastian, an innocent little boy, a boy with a gift, or a curse, depending on how it's used. Sebastian has a unique ability, an ability that allows him to mediate between the living and the dead, an ability that SG so desperately desires, an ability that can grant the evil dwarf immortality. Evil that can never be eradicated is bad enough, but evil as annoying as SG is even more frightening! (wheres Lord Tyrion when you need him, am I right?) I've gotta hand it to the new developers, Amax, (formerly ERS) they were somehow able to revamp a dying series. It's obvious that they have combined new forces with the old, to bring this series up to speed with fresh new ideas and features, while still keeping the original essence, inspired by the father of Russian literature, Alexander Pushkin. The graphics are stunning, the game mechanics are flawless, and the storyline flows well from beginning to end. I'm still disappointed however, in the fact that they continue to overlook the fact that none of their games automatically support widescreen. Their games always require me to either play in windowed mode, or adjust my screen resolution (which is a huge inconvenience, after the game, I have to go back into my screens resolution and readjust back to the original setting) If I don't opt for one of these solutions, the game plays in a stretched manner, and I lose the ability to see anything on either side, particularly during a Hidden Object Scene! If other devs are able to solve this issue, why can't they? The second feature I find annoying, is that the HOP's are always repeated in the same location at least once, which becomes boring a second time around, even though they usually change the type of HO's. In this Collector's Edition version, each scene has one of three different valued hidden mechanical hearts. The Red Heart is worth 1 coin, the Silver Heart is worth 5 coins and the Gold Heart is worth 10 coins. You can use the coins to repair your humble abode, by removing boards covering the windows, replacing 5 different windows, repairing the front entrance, landscaping the gardens, bring trees back to life, new pavement and even somehow managing to replant an entire forest that sits behind the house! As far as CE value, I'm not so sure this one is worthy of the higher price tag. 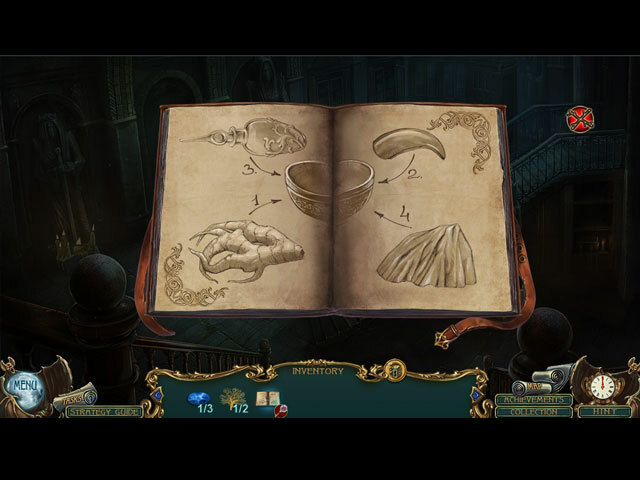 The Hidden Object Scenes are decent, but nothing new is presented in the demo, and so far, there aren't any alternative games offered in lieu of the HOP. There are Keywords in Sentence finds, Multiples of the same item finds, Silhouetted Shape finds, uncovering Matching Pair finds, and several Zoom Zone HOP's with Fragmented item finds. As I stated earlier, several of the scenes are repeated in the same location, but usually with a different type of HOP. The Mini Games are actually fairly entertaining for the most part, although they tend to be on the easier side of difficulty. Below are brief descriptions of some of the games you'll encounter during the demo: 1) Move all the stones along the lines, to their matching colored slots. In the Hard mode, stones can only be moved when a hand isn't over it. 2) Open all "marked" crates to find matching pairs. 3) Swap tiles to complete the image. 4) Arrange pairs of symbols in the correct order at the bottom, matching symbols must be placed next to each other. 5) Repeat the sequence of stones that light up. 6) Place statue fragments correctly within highlighted areas. 7) Arrange the statues correctly according to color and symbol clues on the base. 8) Follow a recipe in the correct order. 9) Select and drag the circle through each pattern, without going outside of the lines. HAUNTED LEGENDS GAMES AVAILABLE IN ORDER Title***Collector's Edition Release Date***Average Rating 1-The Queen of Spades (December 15-10) 4.2 2-The Bronze Horseman (September 11-11) 4.0 3-The Undertaker (November 15-12) 4.4 4-The Curse of the Vox (June 30-13) 4.0 5-Stone Guest (November 15-14) 4.0 6-The Dark Wishes (May 15-15) 3.7 7-The Secret of Life (November 5-15) 3.9 8-The Iron Mask (July 30-16) 4.1 9-Faulty Creatures (December 3-16) 3.1 10-The Black Hawk (March 9-17) 4.3 11-The Cursed Gift (August 24-17) 4.2 This Collector's Edition has 5 Screensavers, 9 Concept Art pictures, 9 Wallpapers, 9 Movie Videos, 4 Music Soundtracks, 13 replayable Mini Games, 14 replayable Hidden Object Scenes, 12 Achievements to earn, Collectible Red, Silver and Gold Hearts (worth 1-5-10 coins) Upgradable house with earned collectibles, a built in Strategy Guide and a Bonus Chapter, enjoy! Rated 5 out of 5 by 1955raven from CREEPY, I LOVE IT !!!!! HAUNTED LEGENDS HAS A HIT WITH THE CURSED GIFT! GREAT STORY ETC. 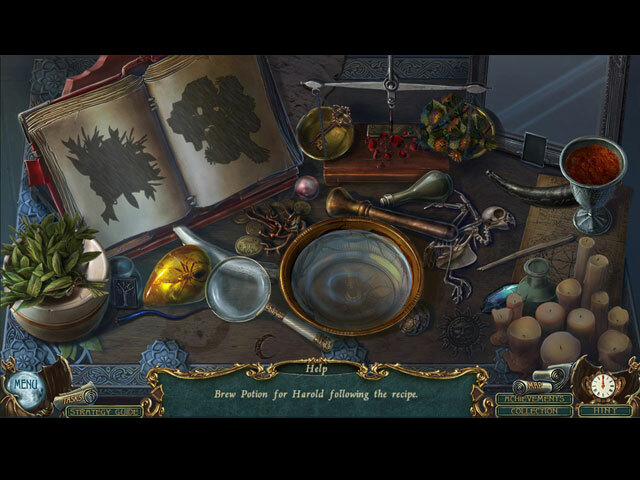 THIS GAME IS EXCITING.EASY TO NAVAGATE WITH SOME REALLY SCARY THINGS MY KINDA GAME !!!! !